Romantic Cello for your special moments..
Hitoshi was my brother in law and his wife's cellist (September '12) at the Ritz-Carlton in Dana Point, as well as for mine and my wife (December '12) at the Balboa Bay Club and Resort. He was on time for both events, and played beautifully for both of our weddings. My wife had made some requests for specific songs, and he accommodated and played them wonderfully. We were very pleased and happy to have him as a part of our weddings. Having Hitoshi as our cellist was romantic and classy for our ceremony and cocktail hour. He is VERY reasonably priced for the quality of work he puts out. You won't regret it!!! Hitoshi was PERFECT. I would recommend him to anyone and will definately use him again. He responded quickly to my emails, arrived on time, has an amazing talent, played longer than expected, was accommodating and make our special night even more special. I was impressed with every aspect of his performance, professionalism, talent and kindness. Thank you so much!!! Hitoshi was incredibly accommodating. I requested he play at a fountain in front of a Starbucks which my friend frequents each morning as a birthday gift. I wanted the event to be anonymous and perfect timing was imperative. Hitoshi showed up at the venue early, contacted me and even texted me pictures so I would know he was there. He checked in several times and the event went off perfectly as planned. My friend was extremely pleased and raved about Hitoshi's talent and presence. I am extremely satisfied with Hitoshi's level of professionalism, dedication and incredible talent. I hope to have occasion to engage him again at a time when I can be present. 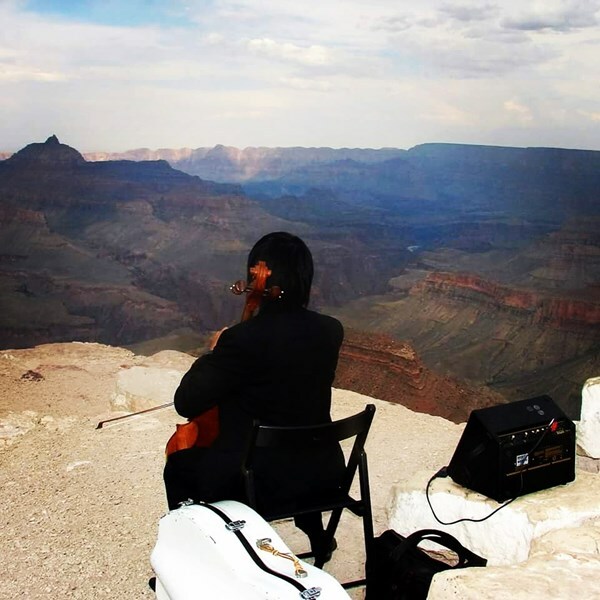 Hitoshi drove all the way out to Joshua Tree National Park to play his cello for about 30 minutes in what turned out to be quite chilly weather. He did a fantastic job accommodating our requests for non-traditional cello music and was a pleasure to finally meet in person after only communicating via email leading up to our ceremony. I would definitely recommend him to anyone getting married in California! Excellent. Very professional and the performance was amazing. We hired Hitoshi (Romantic Cello) to play at the memorial service for our Mother. He was all that we could have asked for and added a very special touch to the service. He was extremely professional and played beautifully. Several of our guests took his business card, as they were equally impressed by him. Hitoshi has the highest level of professionalism and musical ability. He arrived for our garden party and fit into the ambiance and style of the party with ease. He was "in the zone" and immersed in his music -- playing for longer than the contracted time period. No watch checking, and committed to his contribution to the party. Great jub! Hitoshi was awesome. He played before and during our wedding ceremony. Before the event he was always quick to respond via email and on the day was at the venue early and ready to go. Very very professional. Not only that but at the end of our ceremony when our Ipod malfunctioned in playing our favorite song he saw something was wrong and immediately played to cover the mistake, saving the day. I would highly recommend him to anyone looking for a very talented and very professional cellist! Hitoshi of Romantic Cello was so wonderful! Before the wedding we spoke a number of times to go over the best music and instrumental duo for our special day. Hitoshi took the time and care to answer each and every question and never made me feel bad for asking! On the day of our wedding he played the songs we requested for cocktail hour and our ceremony music was perfect too! Our family and friends were so impressed and I heard a number of people say that they look forward to hiring him for future events. His cello and digital piano are top quality instruments At first, I thought he had brought a real piano with him! I highly recommend Hitoshi for your event! 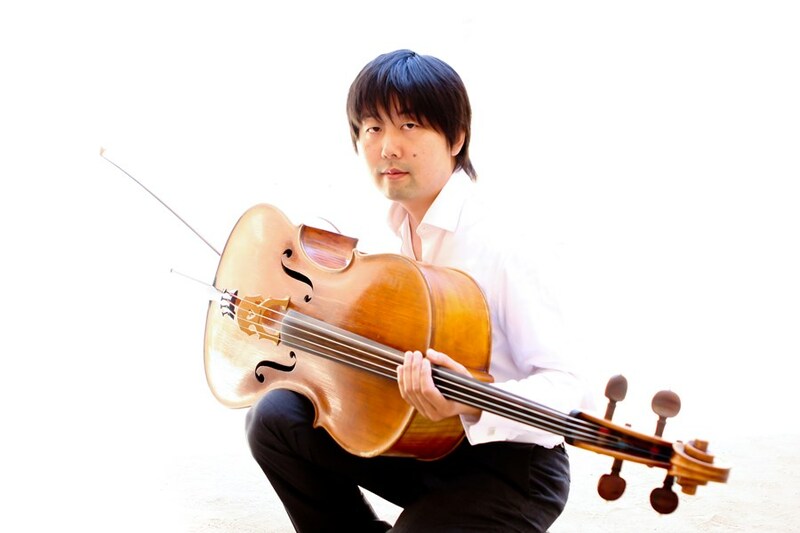 I can'begin to say how satisfied I was with my experience with Romantic Cello- Hitoshi Suzuki. He was professional during the entire process of planning my wedding. Not only that, but he was so accomodating with my special requests for music. My wedding ceremony went just how we discussed and just how I envisioned my big day to be. I was so impressed by his talent as were my guests. 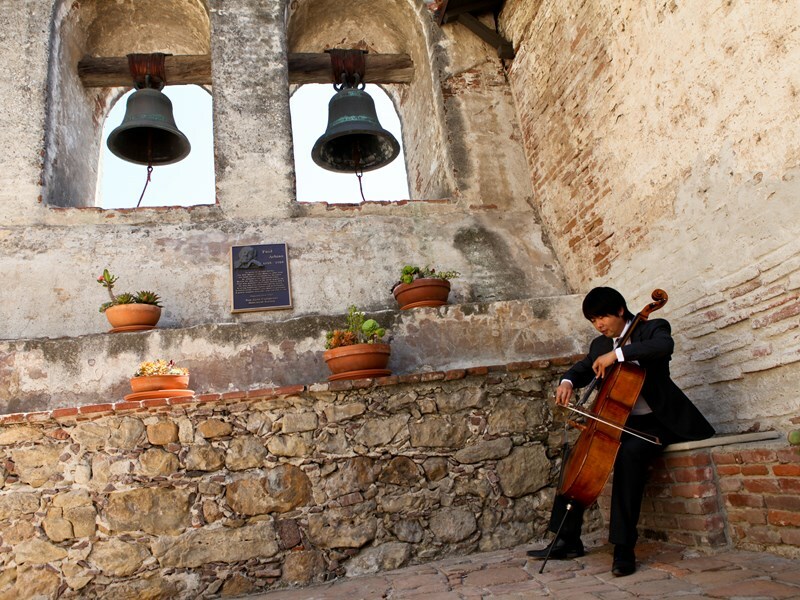 I would definitely recommend Romantic Cello for any event! I was very satisfied with my experience. Bridal Chorus "Here Comes the Bride"
Concert Etude "On the Seashore"
Please note Romantic Cello will also travel to Laguna Beach, Lake Forest, Mission Viejo, Irvine, East Irvine, Laguna Niguel, Rancho Santa Margarita, Newport Beach, Trabuco Canyon, Aliso Vajeo, San Juan Capistrano, Corona Del Mar, Dana Point, Silverado, Tustin, Balboa Island, Santa Ana, Capistrano Beach, Balboa, San Clemente, Costa Mesa, Orange, Atwood, Fountain Valley, Huntington Beach, Villa Park, Anaheim, Corona, Garden Grove, Midway City.